Catherine of Siena, what an impressive woman and Saint! As I start on our sister’s story, like with the other powerful women in the Church, I can feel tears coming to my eyes, tears of joy. Thank You, Lord for the privilege of passing on what we have learned through our pilgrimages to the Shrines, as well as through the historians before us, who have felt this lady and her life so essential a part of the Story of our Church. As we write on the lives of these women we experience the same feelings we have had when we have walked on the cobblestone roads they walked, and touched the walls of the rooms they touched. If these walls and stones could talk, they would sing of the Glory and Love of Jesus and His Mother, as They spoke to and guided these Saints in their journey of faith to the Kingdom. I’m so excited! Please stop a moment and pray with me that the words that flow on these pages be those of our Lord, the message He has for you today. In 1347, Catherine was born into a large, wealthy family, the 23rd child of a family of 25 children. Catherine’s parents built their huge home, which you can visit till today, in the heart of the city on Via dei Tintori (Street of the Dyers). Their home included their Dye Works on the lower level and rooms above, where most of their surviving twelve children (thirteen having died at infancy), with their spouses, the family servant and dye workers lived and ate. It was, all in all, a very impressive home, with its courtyard and beautiful gardens, but not a very peaceful one. The hustle and bustle of the business, right there in the house, drowned out whatever quiet family life they might have enjoyed. The choking, putrid fumes from the dyes below, permeated all the rooms of the house, clinging to everything; the stench on their clothes following them, lingering long after they had ventured out into the streets. One day, Catherine and her brother were slowly returning from the country home of their married sister Bonaventura, as Catherine loved and preferred the peaceful countryside. She paused on the hillside to look over the valley. Her eyes travelled toward the great Basilica of San Domenico (St. Dominic). She saw a Vision which would affect and determine the rest of her life. Catherine saw Jesus seated on a throne, dressed in the white, gold-embroidered vestments of the Pope. On His Head He wore the Papal Tiara which has been passed on for almost two thousand years from Pope to Pope. Standing beside Him were the Apostles St. Paul and St. John the Evangelist, but He was not looking at them. Instead His Eyes were on Catherine, His Love and Smiling Face filling her with a joy she had never known before. He stepped toward her and blessed her with the sign of the Cross. Her eyes fixed on Him, she felt herself rising out of her body, being removed from the world around her, losing consciousness of her very self. There was such a magnetism drawing Catherine to the Lord that although only six years old, she knew her childhood was over. Catherine reminds us of the children, who after our Lady touched their lives at Fatima; their toys meant nothing to them. She turned back to the Vision, but Jesus was no longer there. She was so upset with herself. Had He left her because she had turned away from Him, even for a moment? She was to give her “yes” that day; and her commitment to say that “yes”, day in and day out, for the rest of her life. We are sure that “yes” took all the strength she had at times; as she was tested, failing; as she was lifted up by our Lord, falling; as she was armed anew with His Love, going on to the next “yes.” The life of a Saint is the story of a War, easy reading, but hard living. Catherine and her brother, on returning home, shared nothing of what had occurred with the family. We are told Catherine was a very healthy, happy child. But, Catherine, the beautiful child, was to grow into an exquisite young lady with golden hair, the pride of her family. She had an infectious, bubbly personality, her joy only surpassed by the love that she so generously poured out to everyone. Although she always made herself available to make the rounds of the sick with her neighbors, she preferred to be alone. You can still see the dark corner of the house, where she would go off, pretending it was a cave and she a hermit. The means of flagellation, or the discipline1, a knotted rope she used on herself, is still there in the little room, beside an iron grate she used as a pillow. She was not easy to play with as a child; being strong-willed, she insisted all the children play Saints or better yet, hermits. When she could convince them, she would play teacher; making them recite after her, the Lord’s Prayer and the Hail Mary. She also taught them about fasting and penance, introducing them to the knotted rope she used for discipline, that they then proceeded to use on one another. This play-acting was good for children, but soon Catherine desired the real thing. She left the house one morning to seek out a cave where she could begin her life as a hermit. Well fortified, a loaf of bread under her arm, she walked to the outskirts of town, to a deserted area dotted with caves. She entered a cave where she would begin her new life. She fell on her knees and began to pray. She went into a state of ecstasy1, feeling nothing around her, not even her own presence. When she came out of this trance, she didn’t know where she was or why she was there. She began to worry. It was getting quite dark out; she had been away from home a long time. Were her parents worried? She feared the gates of the city would be closed. She hurried home, trying to run unsuccessfully, her legs feeling like lead, weakened as well by so much kneeling. Lord, let me just get home and I promise never to worry my parents like this again, she prayed, bargaining for all she was worth. How many times have we said this as children? 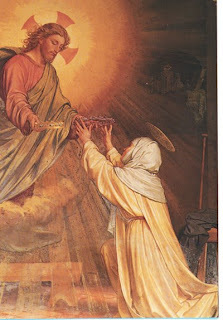 Catherine of Siena, what an impressive woman and Saint! As I start on our sister’s story, like with the other powerful women in the Church, I can feel tears coming to my eyes, tears of joy. Thank You, Lord for the privilege of passing on what we have learned through our travels to the Shrines, as well as through the historians before us, who have felt this lady and her life so essential a part of the Story of our Church. As we write on the lives of these women we experience the same feelings we have had when we have walked on the cobblestone roads they walked, and touched the walls of the rooms they touched. If these walls and stones could talk, they would sing of the Glory and Love of Jesus and His Mother, as They spoke to and guided these Saints in their journey of faith to the Kingdom. One day, Catherine and her brother were slowly returning from the country home of their married sister Buonaventura, as Catherine loved and preferred the peaceful countryside. She paused on the hillside to look over the valley. Her eyes travelled toward the great Basilica of San Domenico (St. Dominic). She saw a Vision which would affect and determine the rest of her life. You are currently browsing the archives for the Saint Catherine of Siena category.